Oh Mario Kart, here we go again! When I first started at Miketendo64, I was brought on board as a feature writer, who was also to provide reviews and Mario Kart 8 was not the first review I did, but it is one of the first few I wrote and now as we find ourselves in the present, I get to review the game once more for a different platform! Mario Kart 8 Deluxe, let’s do this! For those who are blissfully unaware, Mario Kart 8 Deluxe is not a new game per say, but it is a super charged port of one of the Wii U’s best-selling games that has been brought to Nintendo’s newest platform. I can understand why Nintendo would want to give Mario Kart 8 the Deluxe treatment, as surely a Mario Kart 9 or even Mario Kart Switch would have been a welcomed edition, but make no mistake, Mario Kart 8 Deluxe is actually something of a new game in its own right. While it may look like the regular Wii U, it really isn’t as Deluxe comes packed with a whole ton of changes, including graphic changes and they are exactly what we’re going to cover first. The game renders in a native 1080p when the Switch is docked and players are playing in TV mode, whereas the original MK8 renders in 720p, which is something the Switch version only does when in Tabletop and handheld mode (undocked.) The shadows that are seen in multiplayer are now of a higher quality. As for changes that aren’t just graphic focused, there are plenty, but before we get round to the bigger stuff, we’re going to go with some of the smaller stuff. When using Miis, Miis do not have the animated faces we’re used to seeing from the Wii U version. Character icons on the course map are more detailed, players will still get inked by a Blooper even after they finish the race and when using the rearview mirror, your chosen characters eyes can be seen moving to the side to look backwards. Oh and the Fire Hopping exploit has been done away with as well and Deluxe has reduced loading times compared to the Wii U game. But you’re not here for that, you want the big stuff so here it is, the big changes you’re dying to know about since they will impact your decision as to whether you should purchase MK8D since you already own MK8. Balloon Battles: Compete to pop more balloons than everyone else on the track and should you find all 5 of yours being popped, you will respawn with 3 more but it comes at the price of losing half the points you acquired. But there is something you can do to prevent this and it is by using Dash Shrooms and boosting into other players and stealing a balloon from them. Renegade Roundup: This is a game with two ways to play, since there are two sides to it. If you are on a team comprised of the Authorities, you need to scour the track catching the Renegades by having your Piranha Plant bite them. Be warned though that Renegades can use items on your Piranha Plant, which if hit, will prevent it from biting for a short length of time. However if you find yourself on the side of the Renegades, your job is to avoid capture at all costs until time runs out, in which will see your team emerge victorious, but if you or a teammate do end up being caught, driving through the Switch beneath the jail they are being kept in will free them. Failing to free them and evade capture results in the Authorities winning. Bom-omb Blast: Quite like Balloon Battle, players have 5 balloons at the start and earn points by popping the balloons of those they are competing against, only the only item you’ll encounter here is the Bom-omb, but you can stack up to 10 of them at a time. Also just like Balloon Battle, if you lose all your balloons, while you will respawn, you will lose half the points you earned. Coin Runners: For the players who hate having their Balloons popped, this non-balloon focused Battle Mode will have you hunting down as many coins as you can before they are all taken by the other players on the track, and once they are, it’s time to get to work with those items. Attacking players will cause them to drop some of their coins, whereas boosting right into them with a Dash Mushroom will allow you to steal them directly and that is something you’ll want to get into the habit of, is you wish to succeed in this battle when playing online! Shine Thief: Last but not least, this Battle mode is a hold nothing back event, as each player on the track (real and CPU) must face each other in a bid of snatching the Shine Sprit for themselves and holding on to it long enough for the clock to count down to zero, whilst everything else comes at them with everything they’ve got. And if you think that’s bad, when you have the Shrine Sprite, it actually slows you down as well, making you even more of a target, but this is seriously a fun event and it’s my favourite mode of the 5. But just in case all of that isn’t enough to make Mario Kart 8 Deluxe enough of a new game for you, Time Trial now supports 200cc, all cups and cc modes are also available from the get-go. The stats for vehicles have been revamped, resulting in players needing to play around with each of the vehicles to see what really works for them now, but there’s also a Smart Steering feature for beginners, tilt controls and auto-accelerate. These three things can be turned off as they are optional, and turning Smart Steering off is something you’ll want to do as a new Mini-Turbo level has been added as well! As blue sparks can go to orange, orange can now level up to pink sparks, aka Ultra Mini-Turbos is now available, but this is only achieved if Smart Steering is turned off. Without a doubt, Mario Kart 8 Deluxe is a Mega Evolved version of the Wii U game with plenty of new additions which includes the Feather and Boo items and the fact you can now carry two items at once instead of one! Also no matter what speed you play it on, it is a hugely addictive anti-gravity racing game where 1st place is the only position that matters if you wish to get 3 Stars on every race cup, which supports stunning graphics and astonishing colours and as for the online stuff. It’s pretty much everything we’re already used to seeing in the past, but now players can actually change their character and chosen ride whilst in the lobby, although there is a bug at play. For any Switch owner who has over 100 friends, you will be unable to create a private session as the game tells you that you have no friends and that you should try adding some. Mario Kart 8 Deluxe is everything we wanted Mario Kart 8 to be, sure there’s no being able to wheelie on every two-wheeled vehicle like Mario Kart Wii offered (yes, I’m still sore about that,) but and I can’t believe I’m saying this, but Deluxe really is the best Mario Kart game in existence. I wasn’t actually a fan of Mario Kart 8, sure I could see it was a great instalment, if not the best MK game ever seen in the year of 2014, but as far as MK8D is concerned, I don’t hate it. 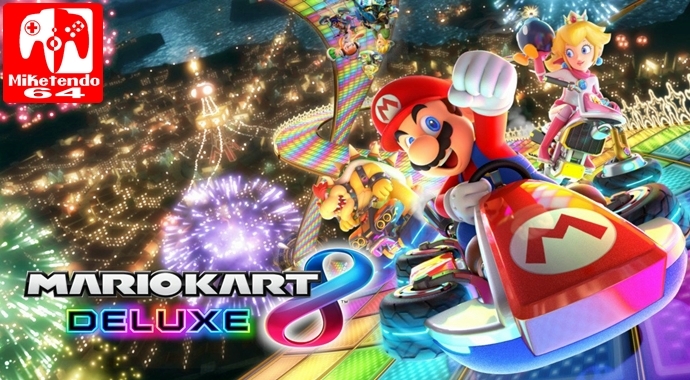 With its promising wholesome content, a more thought out execution and the “new game” feel a lot of us can’t get enough of, MK8D is just the definitive version of one of the Wii U’s greatest games and a game that really raises the bar as far as a future Mario Kart 9 is concerned, but while many have scored it a 10, Mario Kart 8 Deluxe will get no such score from me on this day. There is a temptation to give it a 10/10 but I just can’t do it, so instead I’m going to give it a 9/10. While it is the best Mario Kart game ever, at the end of the day it is just a greatly enhanced port and I’m not quite ready to give ports a 10/10 score. As for buying it though, if you truly love the Mario Kart series and own a Switch, by all means go out and buy it, but if you own Switch and a Wii U and have Mario Kart 8, while Deluxe is superior to it in every way, it’s not the cheapest game in the world, so unless you really, really want it, it is okay to wait a month of two to see if you can get it on a discount. Thank you for joining us for such a lengthy review. We hope you enjoyed it and that it assists with the tough decision that awaits/currently grips you. I am sort of sad I will never buy this game, but then I remember it costs 60 bucks and only adds a mode and a few tracks to a game I already own! Nevertheless, it certainly must be the definitive version of what is the best Mario Kart game. So one cannot go wrong with it.